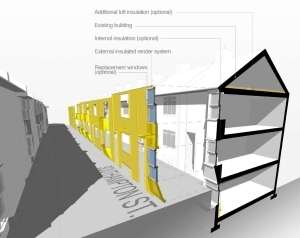 Challenging targets to reduce carbon emissions have resulted in UK Government plans to insulate 3.5million, predominantly Victorian, solid walled homes. The most effective solution seems to be external wall insulation but the problem is how to achieve this without ruining the character of these often protected buildings. A study that explores this issue has recently been completed by Phlorum and BBM Sustainable Design architects, which was funded by LEAF and sponsored by Brighton and Hove 10:10 together with Hanover Action for Sustainable Living. the energy efficiency improvements resulting from the insulation. when combined with other measures external wall insulation can achieve around a 68% reduction in CO2. The study is available to download here.